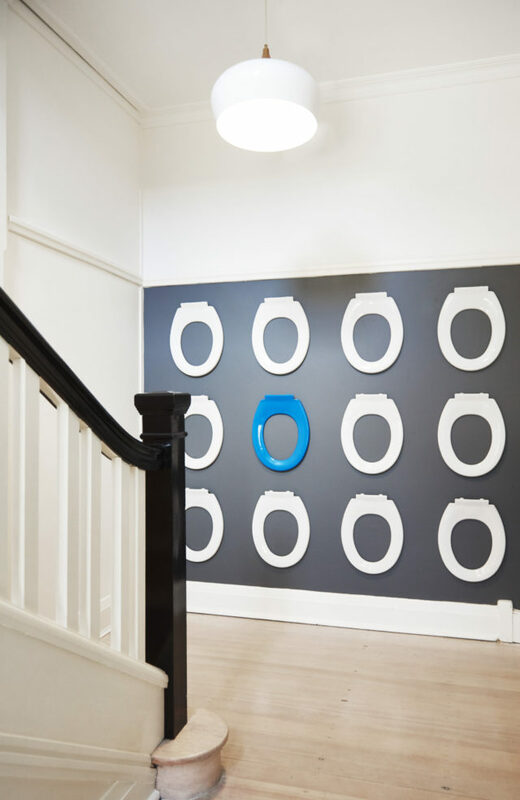 Inspired use of cobalt blue and toilet seats in office reno! 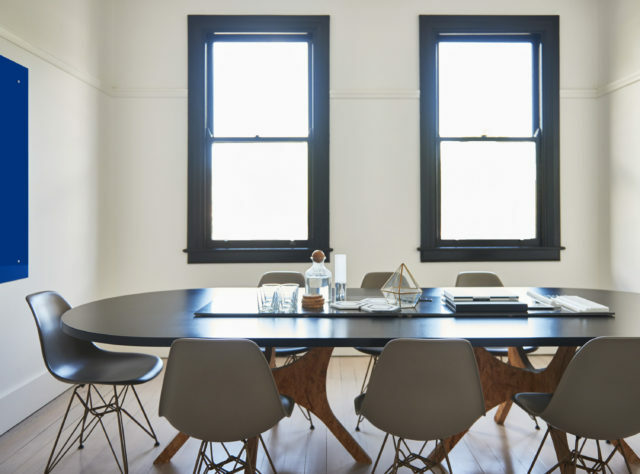 When Sydney reno specialists Integriti Bathrooms (they did my bathroom recently) moved into new offices in Willoughby, they had great 1920s bones but were in a shocking state of repair. Enter interior designer Lynne Bradley, who helped bring the design-loving boss’s vision to life. 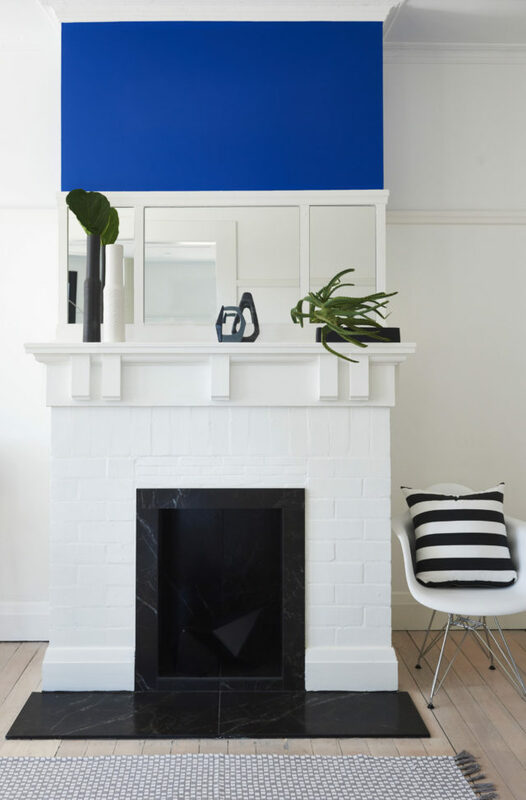 She quickly decided to make a feature of the the cobalt blue from the company logo as a signature colour that would unify each space in varying ways and add energy. 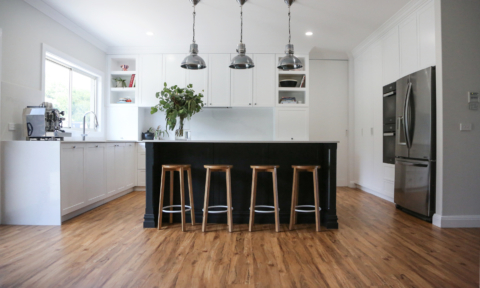 “In addition to this, adding texture was extremely important. Rather than hanging a sign in the entrance, I was keen to play on inference by suggesting a collage of toilet seats, of course with the signature blue as a teaser. 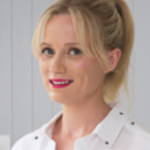 It’s a fun talking point, with no doubt as to the nature of the business.” She’s even recommended that this feature wall be changed seasonally, from toilet seats to taps to tiles to basins! 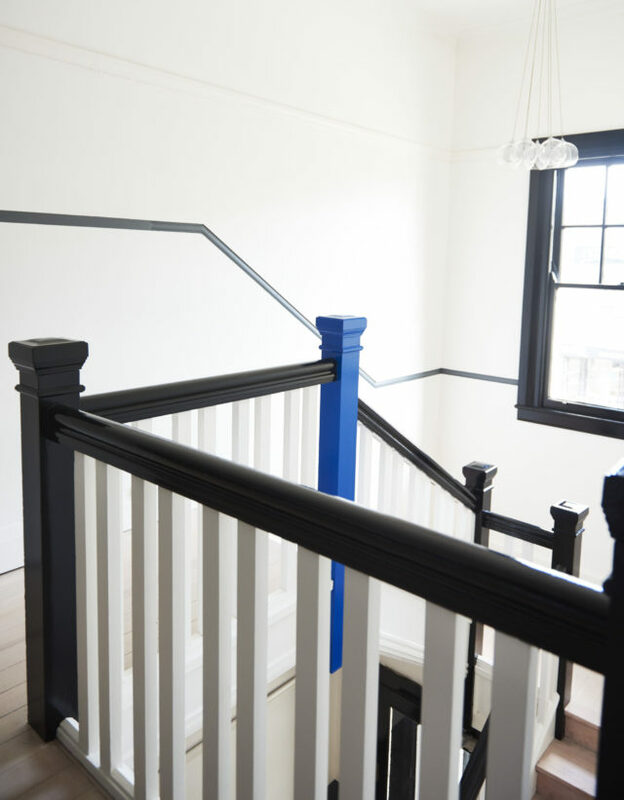 Moving from the entrance to the top floor, we just love how the staircase has been punctuated with one blue post which sits comfortably amongst a black and white palette. 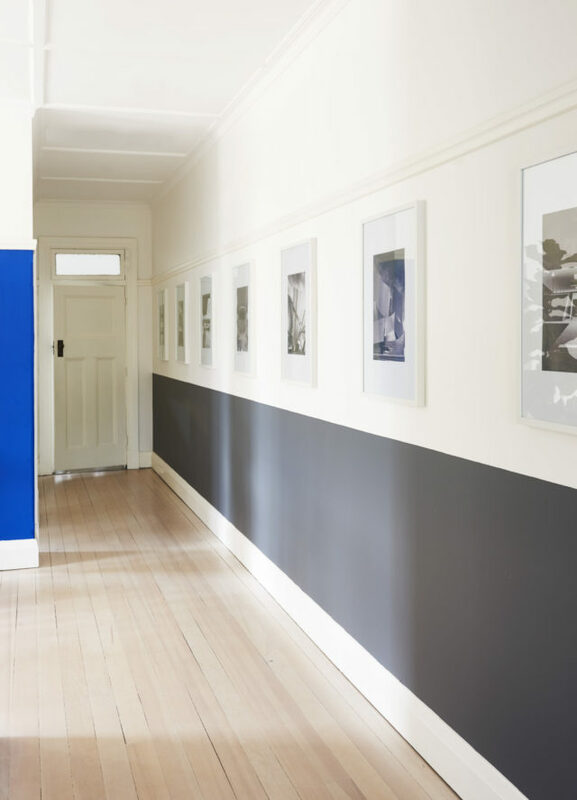 “By adding a charcoal dado line on one wall on the top floor hallway, a sense of flow between each room is created,” explains Lynne. 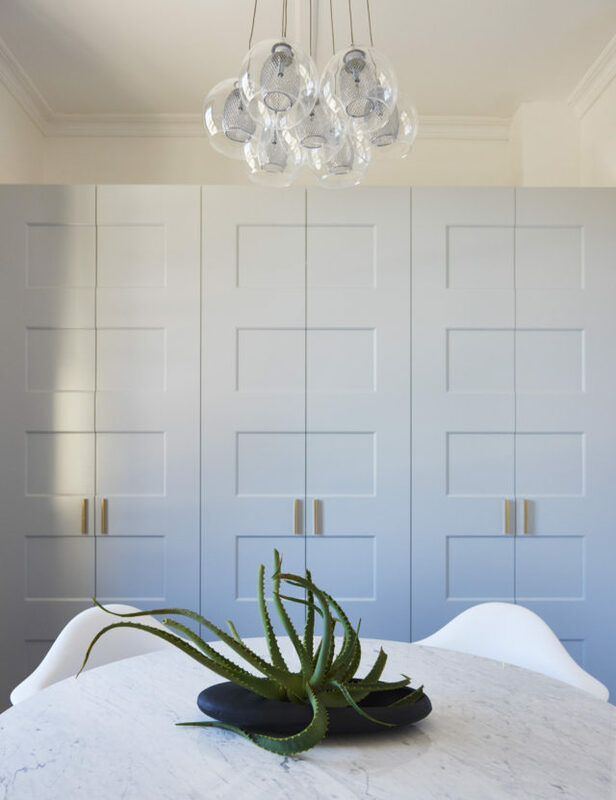 “The client meeting room was in great need of storage, so I looked to the existing architectural features of the building to create patterned and textured cabinetry. The recessed panels on the cupboard doors give interest and depth to this small room and the soft grey colour and bespoke brass hardware (from Made Measure) add a touch of glamour.” Rather than including the signature blue through paint here, Lynne instead ordered a stunning coloured cow hide (from Art Hide) to soften the room and inject much needed energy, trimmed to fit perfectly. It was really important to Andrew to get this workspace right. “My vision was for a light-filled, designer look; bright, welcoming and a place where a team would be happy to work and feel like they’re at home. Some of my inspiration was drawn from beautiful spots I’ve been to in Sydney and seen in design mags, with a special reference to P.Johnson Tailors’ Paddington showroom. We’ve renovated some of their spaces and I was in complete love with the design and interior style of their shops. 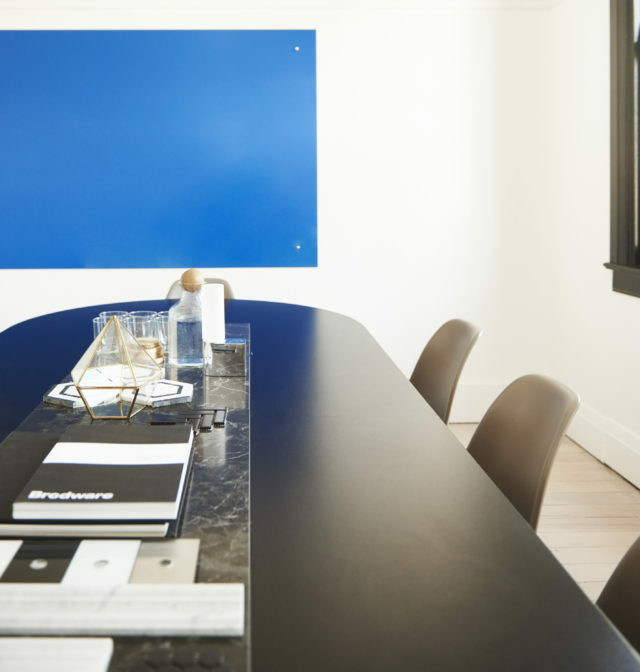 In the staff boardroom, the cobalt blue was injected through a custom coloured glass ‘white board’. “Creating a flat lay through the centre of the boardroom table added much needed visual stimulation and texture that can be changed depending on products and samples that need to be discussed,” says Lynne. Lastly, the team wanted a ‘fall out’ area to relax and meet in. 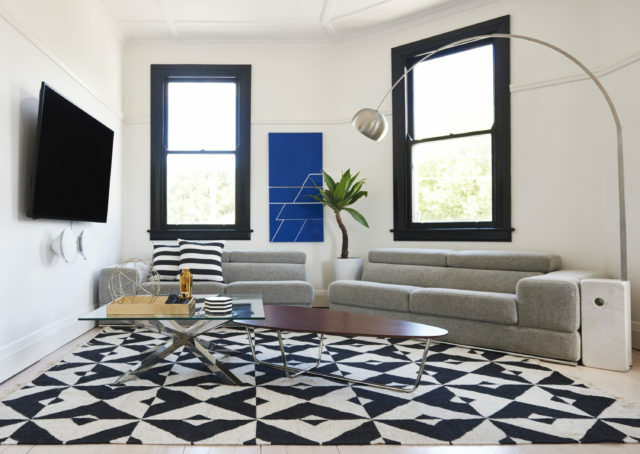 The generous proportions of the comfortable sofa, patterned rug (west elm), coffee tables, cocktail equipment, replica Castiglioni Arco lamp and artworks (also by Lynne!) complete the room. We think he might just be right. I love the office design and styling and Lynne Bradley has done a wonderful job. It’s modern and inviting. I must admit though I’m stumped as I was expecting to see cobalt blue on the Integriti website yet it’s orange everywhere! Many thanks for your lovely comment. You’re right, there is very little blue on the Integriti website, and what is there isn’t cobalt blue. The premises have large signs outside the building that are both cobalt blue and orange, and the team wear branded shirts with cobalt blue on them, which is where I got my inspiration from. How fun this must be to walk into each morning. It’s bright and fresh and fun!